Tintagel Castle. Merlin's Cave. Mythical home of King Arthur and the Knights of the Round Table. Just the names alone conjures up images of battles & wizards & men in armour rescuing damsels in distress. I'll be honest, the Disney princess in me was pretty excited to visit when we came to Cornwall. Want to see our CORNWALL ITINERARY? Here you go! 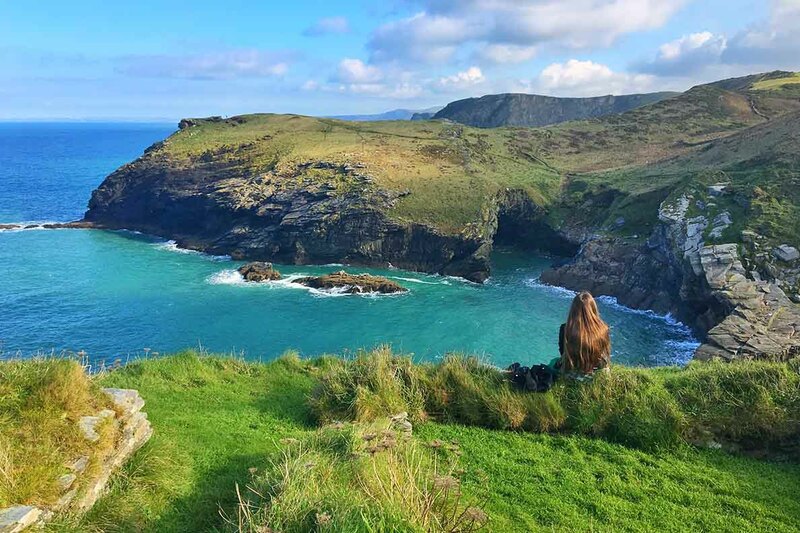 Want to see what Tintagel Castle and Merlin's Cave is REALLY like? How much does it cost to visit Tintagel Castle? Knight of Tintagel Castle- is it King Arthur? Whether you believe the legend or not, a real castle stood on this hilltop- and the ruins are still open to be explored today. I'll be honest, there were more ruins than I was expecting- you can clearly see the outline of what must have been an incredible building, perched right on the edge of a steep cliff and staring out over the rocky Cornish coastline. We spent the night before at King Arthur's car park in Tintagel village itself, after a lovely day spent at Boscastle, (where the witches are!). To avoid confusion, there is a village/ small town called Tintagel, and King Arthur's castle is called Tintagel Castle, which is on the outskirts of Tintagel. Clear?? Good. There are loads of car parks in this one small town and nearly all of them allow overnight motorhome parking for a small fee. It's not possible to book in advance. We drove around several (all of which had plenty of space even in October half term) and chose to stop at King Arthur's car park because it was the flattest one which had tarmac- normally we don't mind camping on grass, but it had rained so much and we didn't want to get stuck in the mud! Little Ship 2 is a lot heavier than our old van! The car park cost £4 for 24 hours – which was pretty good for a major tourist attraction! It's a normal car park though, so don't expect any services/ water/electric/ toilet/ waste emptying. Nothing. It was great to wake up that morning and be able to walk to Tintagel Castle. The English Heritage office is only about 2 minutes from the car park- but then you have a LONG walk down to the ruins themselves. It's probably a good 15 minutes down to the start of the climb. In total, it's a good hour walk one-way. Price for non-members was £9.30 with gift aid. Check the opening times on their website as they close over the winter except for weekends. Dogs are allowed but MUST be kept on leads. Please remember the climb is VERY steep, so it's not suitable for young dogs, or any other dog with walking difficulties. Same applies to humans. There is a land rover service which runs during holidays- we were very thankful for this on the way back! I think it was £2 per person per trip. At the bottom (before the climb up to the castle), there's a little shop, cafe & toilets. Use these- there are NO toilets or facilities up at Tintagel Castle – and it's a long climb! As you can see in the video below, the bay at the base of the hill is beautiful- the sea is clear and such a gorgeous turquoise colour. Merlin's Cave is in this bay- but please be wary of the tides, especially if you're not used to English tides. They come in crazy fast from BOTH sides of the cave and the currents can be very strong. The English Heritage Ticket office can tell you the tide times for that day and when it's safe to explore Merlin's Cave- we were lucky that it was high tide when we arrived so it was going out all morning, leaving us time to explore Merlin's Cave for a few hours! We climbed up to Tintagel Castle ruins- very VERY steep steps and we were all exhausted when we got to the top. There is only one way up and down so there was lots of stopping and starting as the steps are very steep and narrow. Did I mention they were steep?? It probably takes around 20 minutes of non-stop climbing from the cafe at the bottom to the ruins at the top. The more elderly or less fit might really struggle- we saw several people give up and turn back. Unfortunately, because it is an ancient castle built onto a hill, there is no other way to get up there!! But the views are definitely worth it once you're up. Make sure you go to visit the Knight of Tintagel Castle. He's right on the cliff edge- about another 20-minute walk from the top of the stairs- but it's a fantastic sculpture. There is also an old store which the inhabitants of the castle would have used to keep food fresh- it's only a tunnel now but cool to see and walk through it. Apart from that, there are a load of stone walls. They don't really make much sense on the ground but you can see the layout of the castle really clearly on our drone shots in the video. Many people choose to take a picnic up with them, and honestly, that's probably a good idea. We didn't even take a bottle of water, which was a mistake. Just bear in mind that you will need to carry everything up all those steps with you… and bring it all back down again as there are no bins up at the castle. Still, it's a lovely place to stop for lunch- especially if you're lucky like we were and go on a sunny day. Steps down to Merlin's Cave- steep again! After we'd squeezed our way down the steep steps again the tide had gone out enough for Merlin's Cave to be open. As caves go it's pretty impressive- you could see the light from the other side and the waves were crashing in. Jade decided she just HAD to go stand on the rocks in the middle of the cave, which were still surrounded by water! (There go another pair of boots!) But for someone who says she's not very athletic, it was an impressive piece of balancing! Check it out in the video. The cave was definitely our favourite part of the day, although the drone shots of Tintagel Castle are pretty special too. After we'd cheated and paid for the landrover to take us back up the hill to the entrance (don't judge until you've been!) we headed off back to the Motorhome. Just remember it's a LOT of walking and sadly, there's no way around this. But if you go in prepared, dress appropriately (layers, baby- lots of layers!) and take water, you should be fine. And seriously, pick a nice day. The views are incredible. Have you ever been to Tintagel Castle? Would you like to visit? Let me know in the comments below. Don't forget, sharing is caring. Feel free to share this post on Social Media or Pin it on Pinterest! Your actions really do make a difference in letting others know the post is worth reading. Thank you. This place looks amazing! I visited Cornwall on a field trip with uni in June and would have loved to explore more but didn’t have the flexibility. I love exploring the scenes of myth and legend. The castle must have been quite spectacular and intimidating when it was standing. Oh no- such a shame you didn’t get a chance to visit properly. I hope you get time to go back! Neither did we! Such an incredible place- and what a view! !